2014.04.01 CorkCamera.com: Our April 1st Hoax photos: Shark, Iceberg in Cork harbour. 2014.03.27 Great whale photos off Baltimore taken by IWDG Member Brendan Quinn aboard Celtic Mist. 2013.10.20 Cork Rebel Week Gathering - photos of naval ships, LE Eithne being turned. 2013.09.15 Cork Docks - Kennedy Quay, cranes, animimal feed towers being demolished. 2013.09.07 Kinsale Lighthouse open day Photos & YouTube. Fundraiser for the Signal Tower .. more. 2013.08.25 Verolme Dockyard Gathering - rare opening to the public - photos. 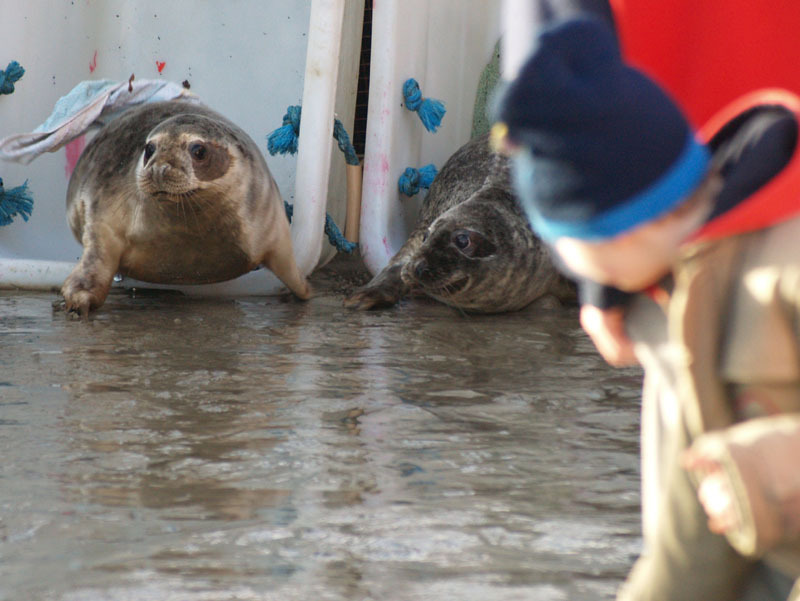 2013.06.30 Dingle Seals new born pups: Photos & Hi-Res Video. Few days old, being tube fed. 2013.06.06 Boaters: Simple DIY project for you to measure phytoplankton with your smartphone. 3013.04.28 20th anniversary of the Shannon Dolphin Project. ShannonDolphins.ie - talks etc. 2012.01.27 Storm waves at the Old Hd Kinsale: uTube; photo Minane Rock hole open bay west. 2013.01.13 1st whale watching trip photos on RV Celtic Mist for IWDG.ie members. 2013.01.04 HMS Bounty in Cork Harbour 2011. Sank Oct 2012 with loss of 2 crew. 2012.07.23 Guided walk West of Old Head Kinisale, part of Ballinspittal Festival 2012. V. Misty! 2012.06.10 RNLI Crosshaven Open Day. Lifeboats, ex-Lifeboats, raft challenge etc. 2012.05.27 Flat Head to Reanies Point Cliffs; Pillars at Reanies Pt, old farm machines, flowers. 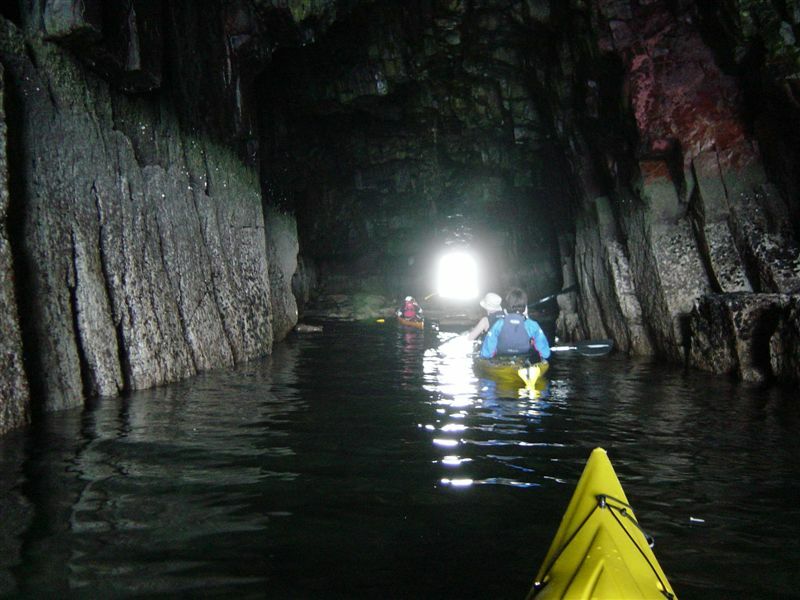 2012.05.20 Hole Open Bay East Old Head of Kinsale; Black Head -medieval? wall (+) cave photo. 2012.04.15 Foynes Flying Boat Museum, near Limerick. 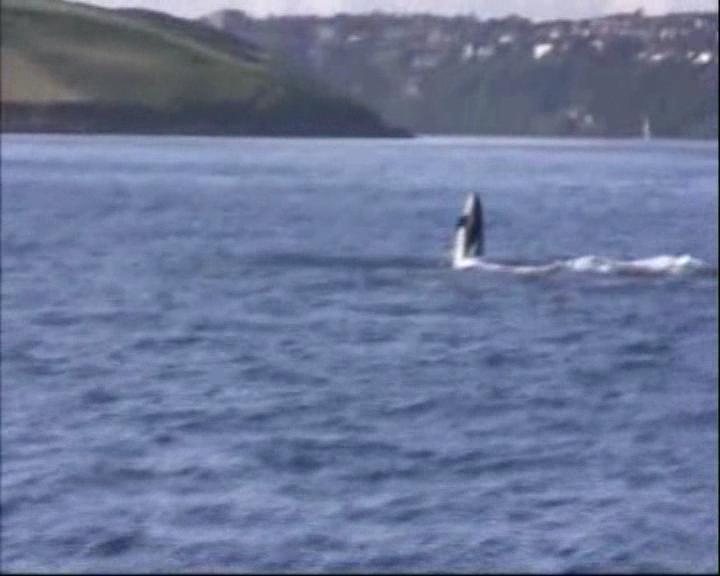 Video shot off the West Cork Coast around Galley Head & 7 Heads areas, the boat's track is shown at the start. The video shows an IWDG.ie researcher, Conor, shooting special darts with a cross-bow at surfacing 60+ ton Fin whales to get skin samples for analysis. Colin, the skipper, had to carefully bring the boat close enough. 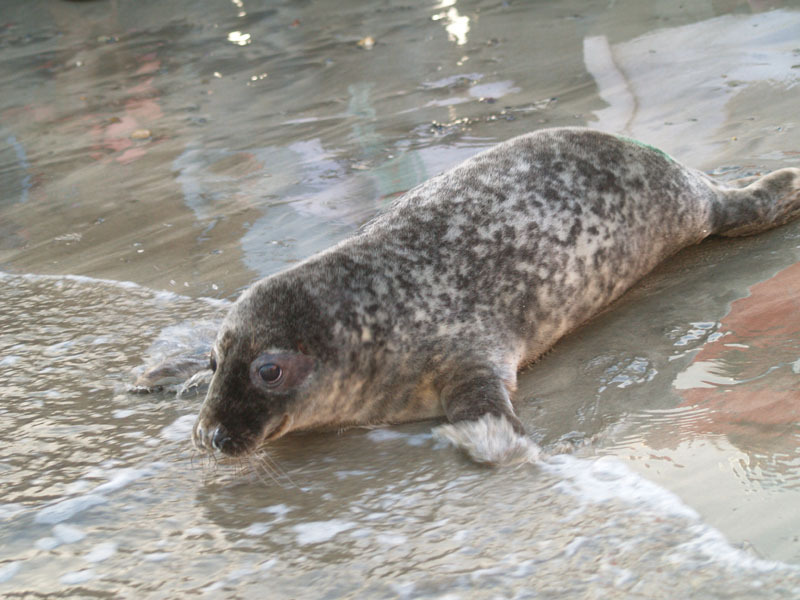 The operation was supevised by a park ranger from the NPWS.ie. 2 min Video YouTube preview. 2011.08.20 Dungarvan beached Sperm Whale. Photos, Video: MPEG/260MB WMV/32MB uTube. IWDG report Marine Map of stranding location. 2010.07.10 Clippers departure in Cork harbour - photo gallery. 2010.04.07 Lusitania 95th anniversary some photos, info, etc. 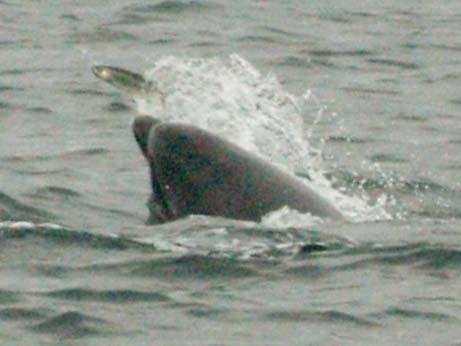 2010.01.10 Breaching humpback off Co Wexford see IWDG page. Video. 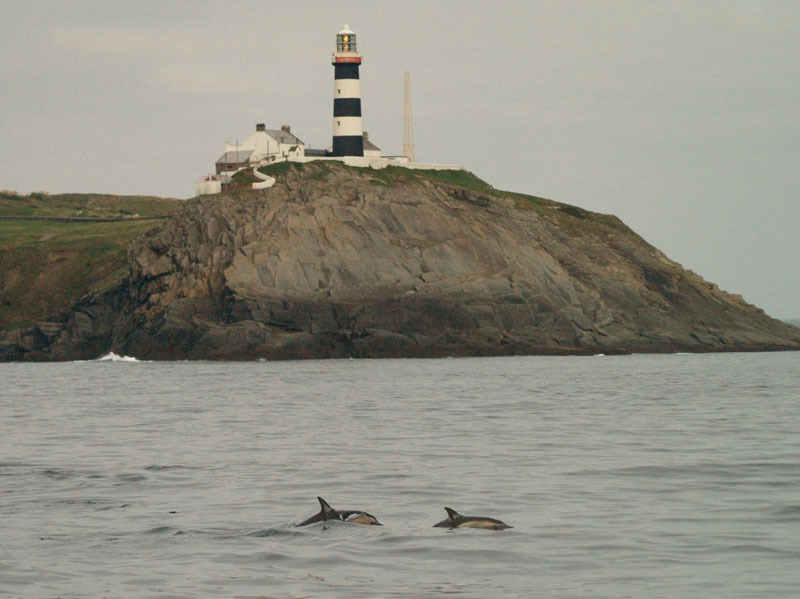 2009.10.09 Common Dolphins on way to kinsale gas field: photo gallery, original photos directory including track & waypoints file. 2009.09.19 Kinsale Dolphins photo gallery, breaching, breaching2, fish has lucky escape, original camera pics directory. 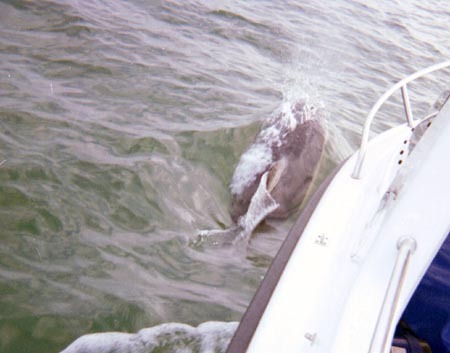 22Jun: Bottlenose Dolphins Kinsale harbour Video clips: Long, Short some photos. Common dolphins galley head photos. New Video clips: Low Res24mb, HiRes, Short. 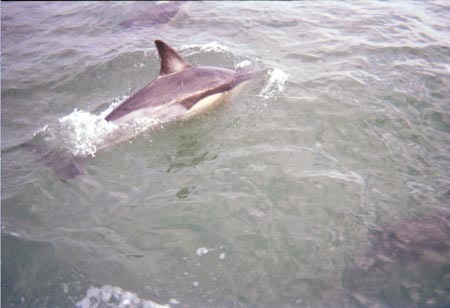 Some common dolphins approach the boat bow riding and and spy hoping.Taken of the old head of Kinsale Co cork Ireland. 11 Sep 05. Some pictures captured from the video. 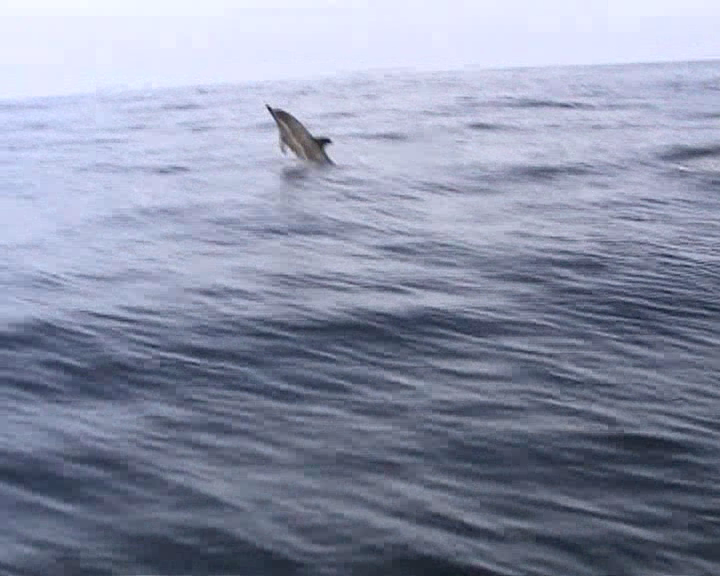 Common Dolphin profile.. Photos, Images, Videos, TV clips and more. 29-Nov-08: Discovered this dead dolphin species (photo on left) floating at the old head of kinsale. Photos. 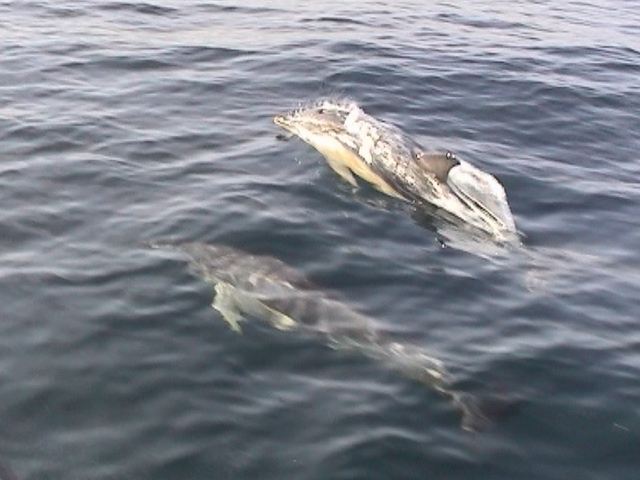 More Pictures of the common dolphins on 3-Nov-07 at the old head of kinsale. Polarizing filter used to give less glare on underwater shot. 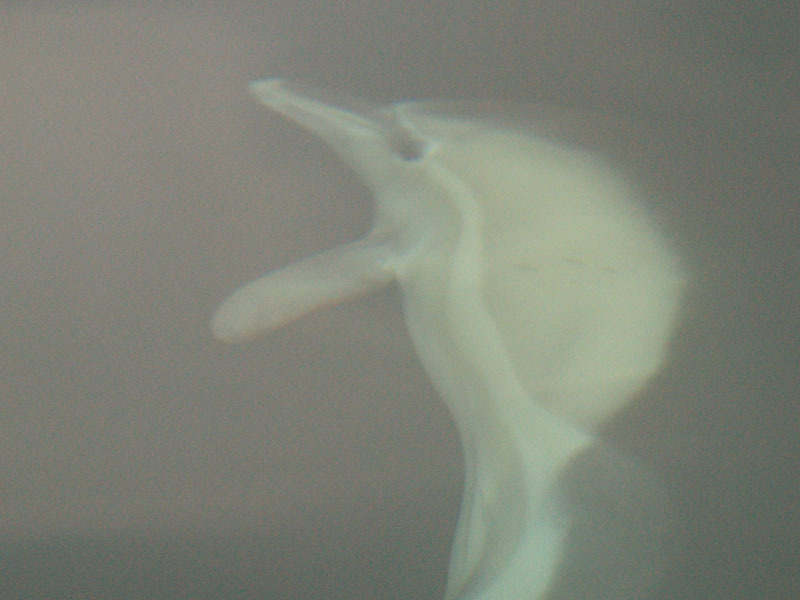 Ever seen a dolphin ghost? have a look at pic KG030400.jpg. 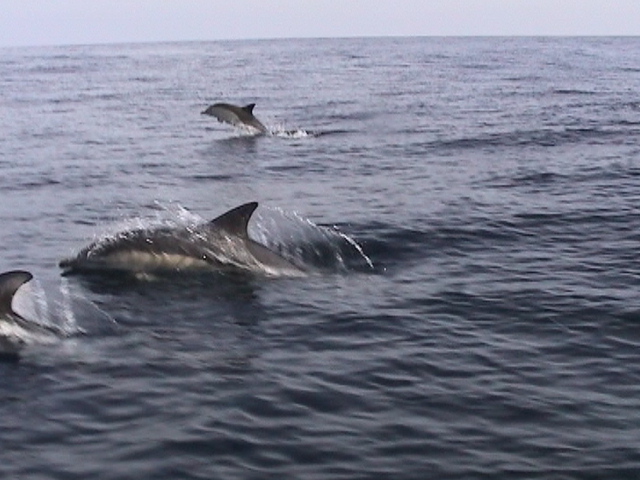 27Jul08 - some more common dolphins at the old head-difficult photo conditions with a heavy swell, a sun fish and rock formations at hole open bay west. 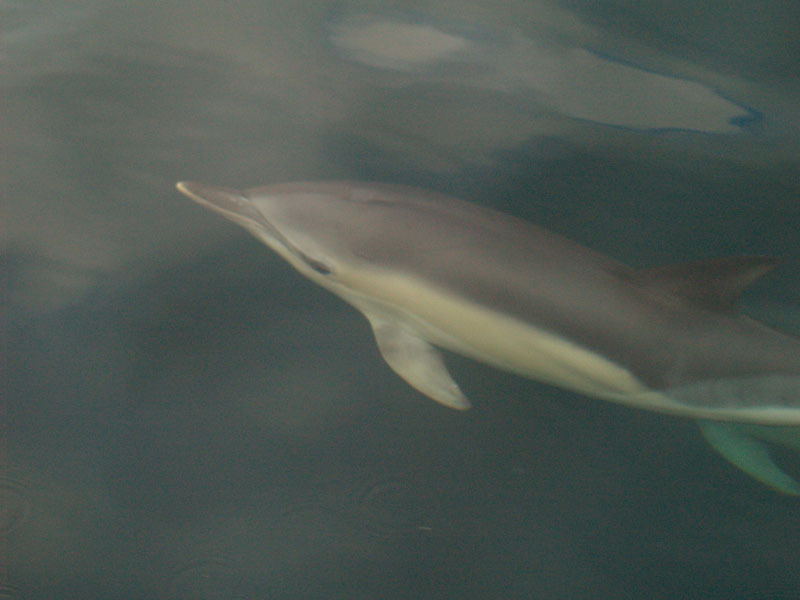 Pictures of the Common Dolphins. 10km South of Courtmacsherry 28 Aug 2007. See the rest of the photos. Jun 2006 Hole Open Bay west at the old head of kinsale co cork ireland. Basking Shark in Kinsale Harbour 9 Jun 07. More Photos. No, they're not really that colour but it gives a better view of the shark against the background. More info on the Basking Shark, the second largest fish. 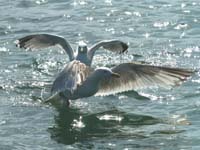 Filter feeder - no teeth - it won't eat you! 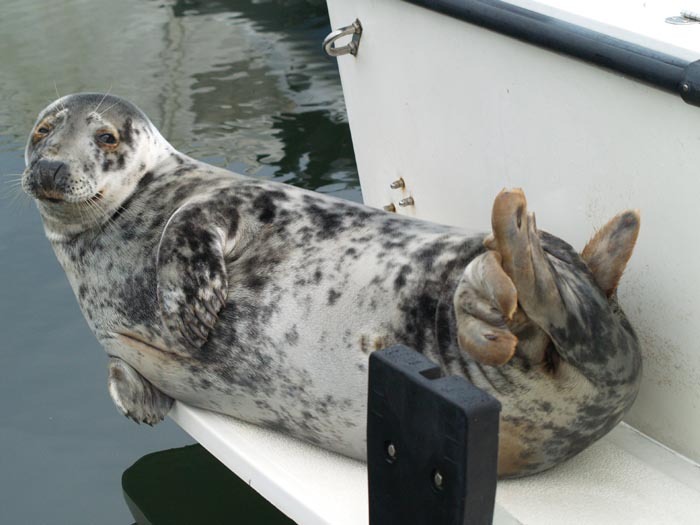 Seal in Kinsale Harbour April 2006. (s)he found a nice flat 'rock' to bask on where the tide never goes out! Fin Whale Nov 2004 on IWDG trip with Colin Barnes.Last picture shows 165km track over 7 hours in search of whales/dolphins. All taken with a 'top of the range' (€7) disposable camera. See all the photos and map of sighting location. Signal Towers of Ireland, built ~1800 by the English to prevent a French invasion. Real map of ireland - including the parts under the sea (pdf).